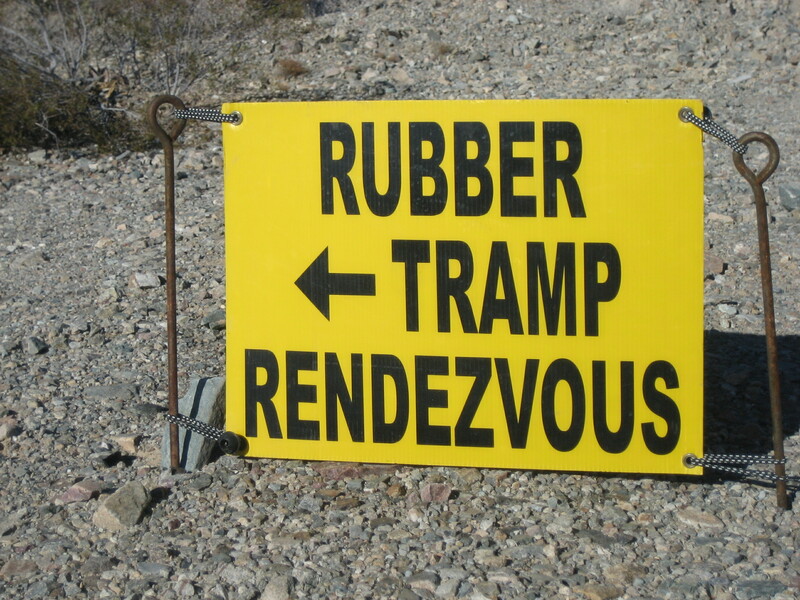 I actually didn’t spend much time at the 2019 Rubber Tramp Rendezvous (RTR). I’d planned to volunteer at the RTArt Camp and stay in that area with The Man in his minivan, but there was a misunderstanding with the main Art Camp organizer, and she didn’t save a spot for us. She tried to squeeze us in next to the portable toilets, but neither The Man nor I wanted to sleep and cook next to the shitters. Besides, we would have been camped practically within arm’s reach of our neighbors, and even if the humans had been ok with that, every little movement from either side would have probably set Jerico the dog to barking. This is the 2018 RTArt Camp banner that Coyote Sue and I painted. The RTArt Camp was in a much better location than in 2018. It was adjacent to the road into (and out of) the RTR and very close to the main stage. I was glad it was easier to find and get to, but having the camp roped off limited the number of people who could park their rigs within the designate Art Camp area. The Art Camp organizer told me only Art Camp volunteers were allowed to stay within the camp. I wondered if this arrangement made the camp feel exclusive to people. In 2018, I had been glad that anyone who wanted to could camp near the art community; I know at least one woman camped near us because it felt like a safe space to her. The Man and I (along with Jerico the dog) arrived at the RTR on the afternoon of January 10. We found our friend Gee staffing the check-in station, and she gave us hugs and wrote down the mini van’s license plate number. We drove to the Art Camp and parked there while trying to decide if we were going to make our camp by the shitters. 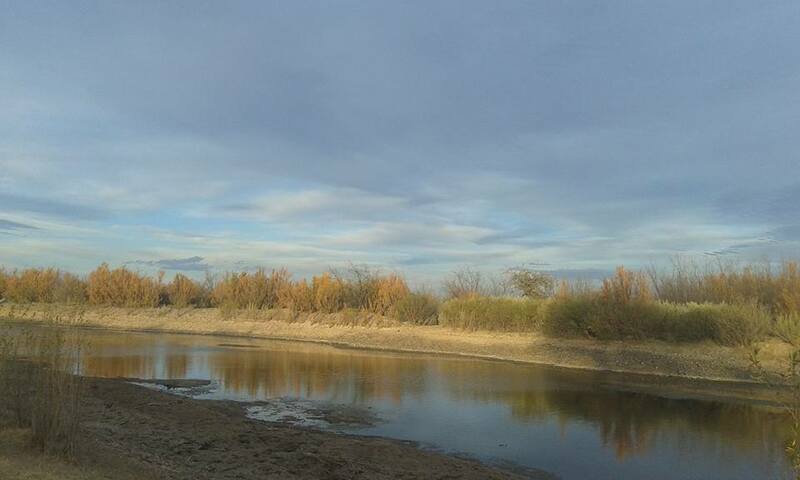 We walked around the RTR a bit while trying to make our decision. We went to the main seminar area where between 300 and 500 people (I’m terrible at estimating attendance, by the way) were listening to the afternoon speaker. We walked over to the free pile which was being curated by a fellow who could have used some customer service training. I found several cans of tuna; a couple of fresh oranges; and a nice, big zipper pouch, but I suspect all the really great scores were snatched up quick with so many people milling about. One change with the free pile in 2019 was that is was only “open” during certain hours each day. In the past, folks could peruse the free pile any time of the day or night. The always-available nature of the free pile meant that if it rained during the night, all of the offerings got wet unless some good Samaritan ran out of their rig and threw a tarp over everything. I suspect at closing time, the free pile volunteer covered everything with a tarp to protect the goodies from the elements. The volunteer on duty also helped keep dogs off the free pile offerings, which probably helped cut down on the amount of dog piss on the items. Covering the free pile for the night surely also kept wayward dogs from spoiling the items. The volunteer on duty received any donations and rejected anything deemed unworthy. On the one hand, I understand not wanting to clutter the free pile with trash, but of course, one person’s trash is another person’s treasure. What if something the volunteer rejected was just the thing someone needed? The guy who needed customer service training met donations with suspicion, as if he believed most people were trying to encumber him with junk. Another change at the RTR was having a camping area set aside for event volunteers. The main entrance to this area was staffed by a volunteer acting as a bouncer of sorts. I didn’t try to get into that area alone, so I don’t know what sort of challenge was issued if someone without the proper credentials tried to get in. Having an exclusive area for volunteers seemed a little strange to me, but I’m not really sure why things were set up that way, other than hearing a volunteer say, We feel really protective of Bob. That would be Bob Wells she was talking about. If you don’t already know, he’s the host of the RTR and the force behind the Cheap RV Living website and YouTube channel. I suppose he probably does have a large enough fan base to cause worry that people might be standing outside his van day and night, clamoring to meet him. As has been reported in numerous other places, the 2019 RTR was HUGE! It was so big, when The Man and I stood at the Love’s truck stop on the west side of Quartzsite, we could look to the east and see the many, many rigs all the way across town at the RTR. It was amazing. It was also overwhelming to imagine living among so many people, so we decided to make our camp in the less dusty, less populated BLM area near Dome Rock. From what Gee told me on the first Sunday of the gathering, everything had been running smoothly. Aside from a few rude people who stopped at the vehicle check-in station, folks had been polite to each other and the volunteers, and everyone seemed to be getting along. I was glad to know most folks had been behaving appropriately. With such a large group camping in a wide area, having the “streets” named and signed seemed to be helpful. I’m sure people were able to meet up more easily when they could at least tell each other with some accuracy what street they were camped on. Another way for people to find each other was by posting announcements on one of the bulletin boards near the main stage. It must have been helpful to be able to leave a note asking to meet up with like-minded people. After all, one of the reasons Bob started the RTR was to give nomads the opportunity to meet each other and make friends. I went to the RTR primarily to help out at the Art Camp and to conduct some interviews for the blog. I spent a few hours at the Art Camp on the afternoon of Thursday, January 10, and I spent the whole day (approximately 10 am to 4 pm) at the Art Camp with a few forays into the wider RTR on Friday the 11th. On Friday, I spent most of my time organizing the supply tent. I managed to conduct five interviews while at the RTR. I know I’ve been saying this for a couple of years, but I probably won’t attend the next RTR. 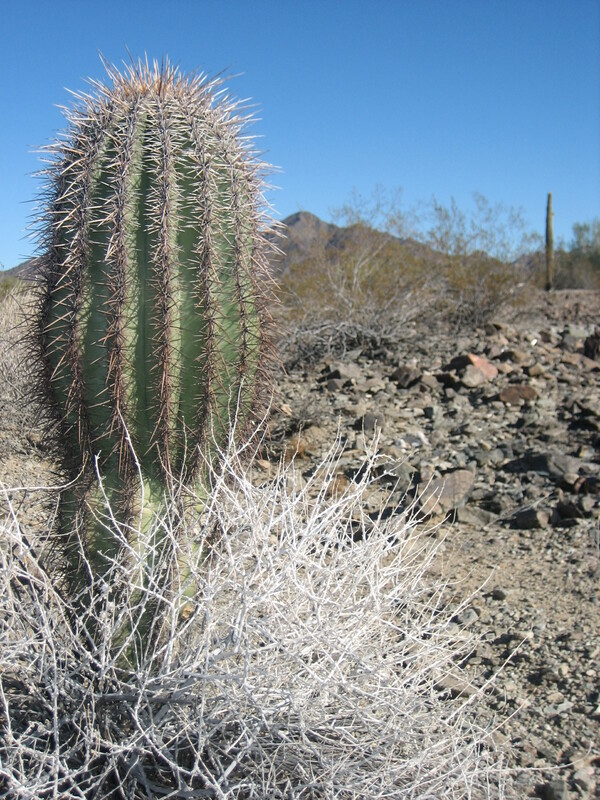 I can do without the stress and expense involved in getting to Quartzsite in order to camp near strangers. I haven’t been to a seminar since 2015, I’m not interested in meeting people to caravan with, most of my friends don’t go to the RTR, and I don’t need any new long-distances friendships. That said, I think the RTR is an invaluable resource for a lot of people. Folks considering living nomadically or beginning a nomadic life can get a wonderful education at the RTR seminars. Nomads who feel isolated and want to make connections with other people living similarly can meet scores of people at the RTR. Meeting new people can lead to friendships, caravans, collaborations, and sometimes even romance. I encourage all nomads who find the idea of the RTR even remotely appealing to brave the crowds and attend at least once. 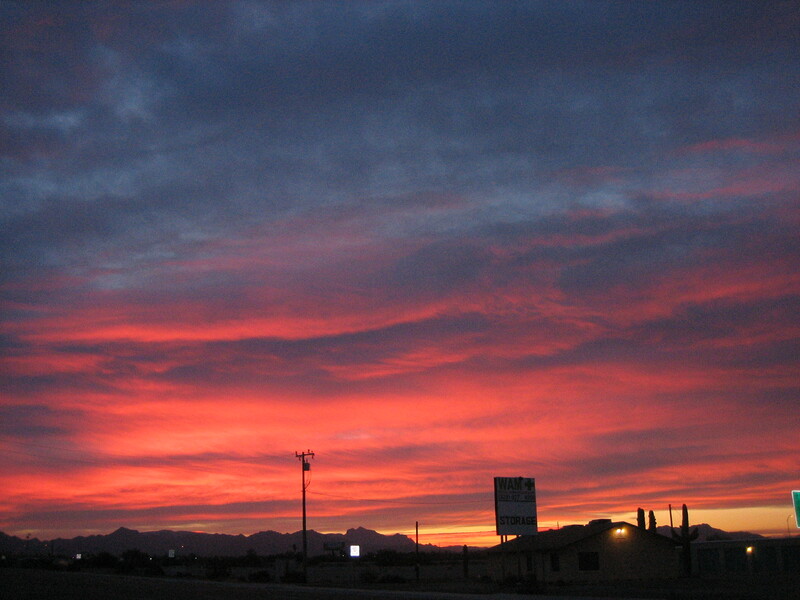 Seems like it always happens when folks start discussing winter in Quartzsite, Arizona. Someone mentions the Big Tent, and someone else says What’s that? Other folks in the conversation jump in and start trying to explain things and mayhem occurs. 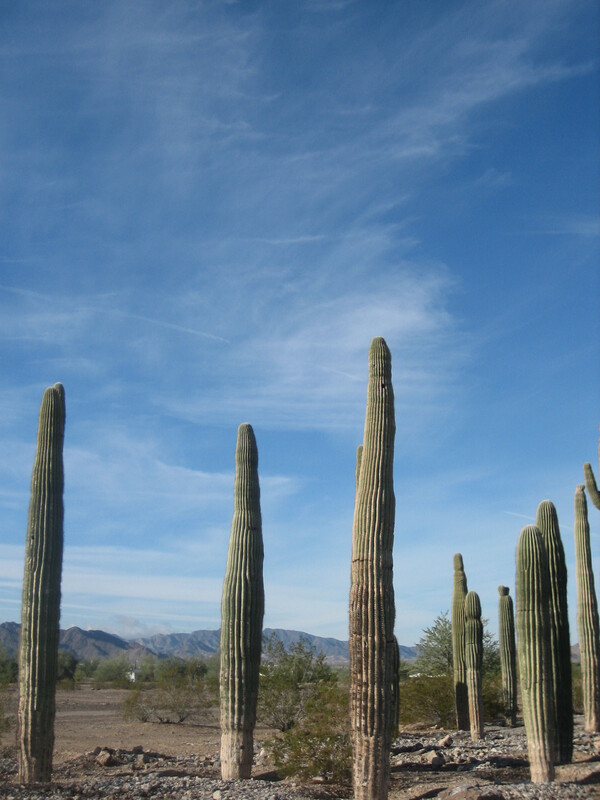 Ok, so I’ve never actually seen mayhem occur during a discussion of the Big Tent, but I know that lots of people who’ve never been to Quartzsite in the winter aren’t quite sure what it’s all about. In the interest of public information, I’ve made today bonus blog Saturday, and I’ll again share what I wrote about the Big Tent in 2015 and 2016. You’re welcome. 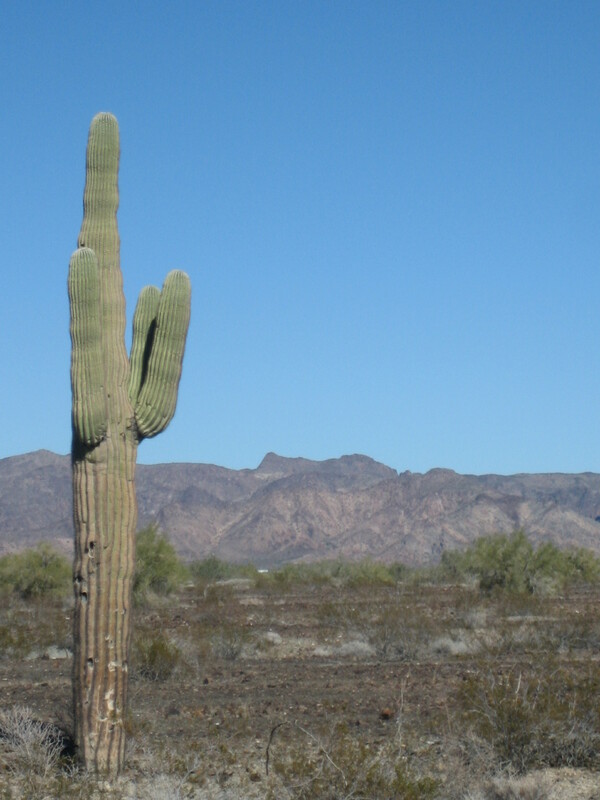 “The Big Tent” is what folks call it, but the actual name of the event is The Quartzsite Sports, Vacation & RV Show. It’s been held every year since 1984, although the location within the town has changed several times. 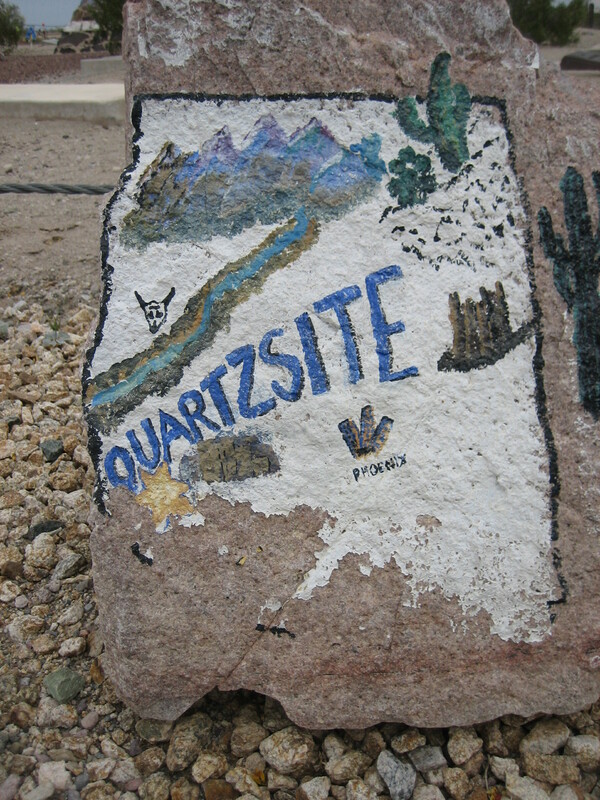 People travel to Quartzsite in their RVs (motor homes, vans, campers, fifth wheels, etc.) 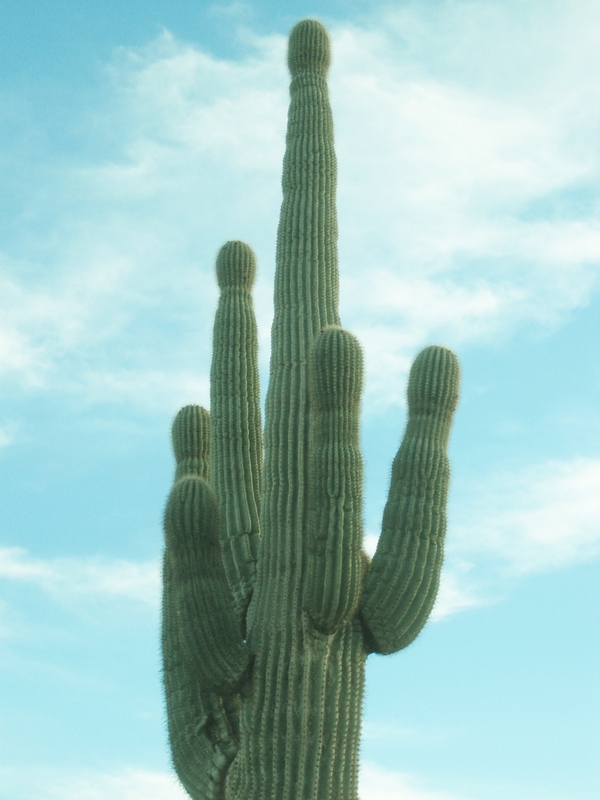 from all over the country to enjoy the warm Arizona weather and see what’s new in the Big Tent. 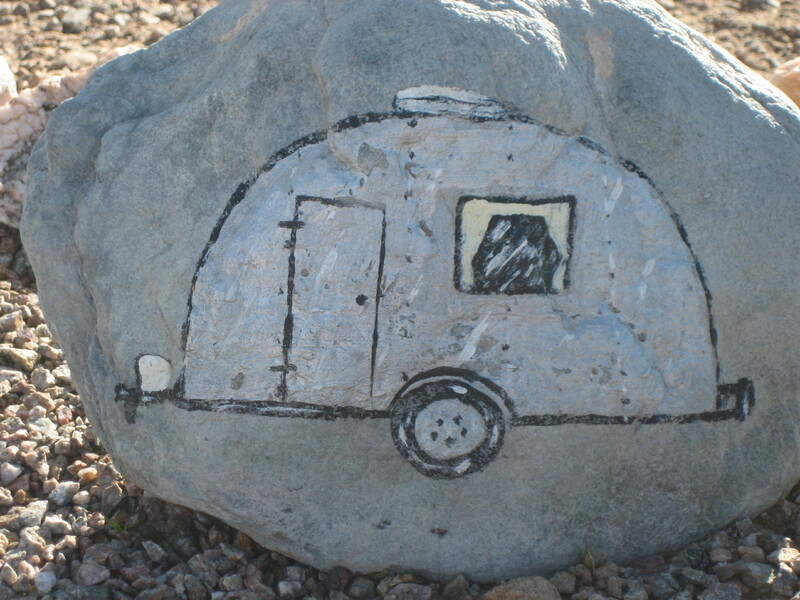 The Quartzsite Sports, Vacation & RV Show started with 60 exhibitors and a small tent. In 2015 it had grown to a 69,000 square foot fully carpeted indoor exhibit area at 700 South Central Blvd. In 2015 the Big Tent was open January 17th through 25th. I visited it on the Saturday opening day and on Tuesday the 20th. 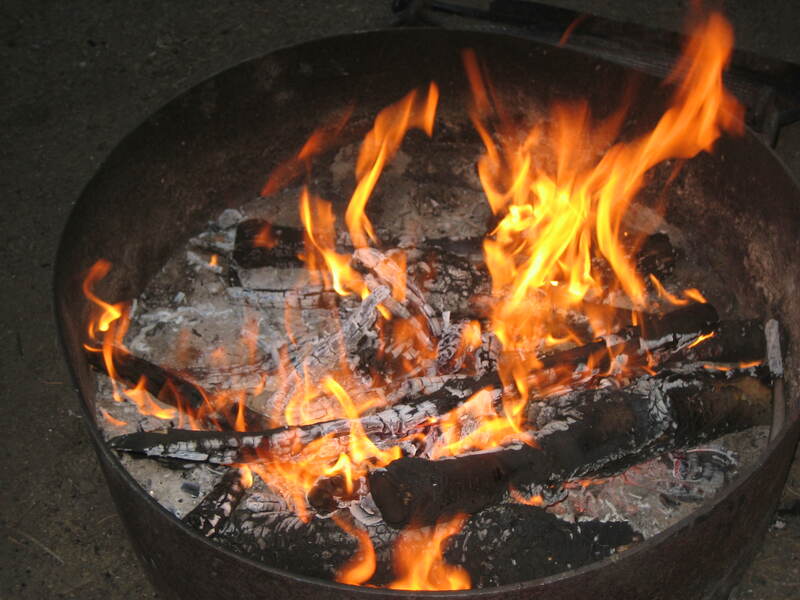 I went to the Big Tent the first time because I was trying to get a job as a camp host. I’d arrived at the tent about ten minutes early, but nobody was getting in early that morning. The line started moving at exactly nine o’clock. By the time I got inside, the place was already packed. I wasn’t surprised to see RV park booths, RV insurance booths, booths staffed with folks trying to convince people to drive their RVs north to Canada and south to Mexico. I wasn’t surprised to see an Arizona State Parks booth, a KOA campground booth, and a Good Sam’s Club booth. Several casinos had booths too, complete with wheels to spin. Spin the wheel, win a prize, but not until one coughed up one’s name, mailing address, email address, and phone number. I tried to win several times but scored nothing more memorable than multiple decks of cards. Several booths were dedicated to recruiting work campers. One of those booths belonged to Workamper News, the website to check out (I was told at the RTR) to get hooked up with work camping opportunities. Amazon.com was present, recruiting for its CamperForce. The sugar beet harvest people were there too, and I had a nice talk with a very pleasant man from the Midwest, but quickly realized that sugar beet harvest work is too strenuous for me. Several companies looking to hire camp hosts were also in the Big Tent. I was surprised to see multiple booths selling pillows. I understand that RVers use pillows. But why would someone buy pillows at at sports, vacation, and RV show? Wal-Mart sells pillows. Kmart sells pillows. Sears and JCPenney and probably the freakin’ Family Dollar sell pillows. Pillows can be ordered from Amazon.com. Why were these RV show pillows so special? I don’t know because I did not stop at any of the many pillow booths and discuss the desirability of their pillows. On a related note, the funniest thing I saw in a booth was a man lying in a bed on a platform a couple of feet off the floor. He was selling some special RV bedding, and he was demonstrating this bedding by lying in a bed. The big come-on with this bedding was that one wouldn’t have to make the bed if one had this bedding. Basically, the bedding was a double sleeping bag placed on top of a mattress. There was no tucking of sheets and blankets because this item was a blanket pouch. Is making an RV bed so difficult that people would rather sleep in a double sleeping bag? In any case, whenever I saw this grown man lying down in bed while trying to convince people to buy his wares, it cracked me up. Unfortunately, I did not have a camera to take his photo. I was also surprised to see people in so many booths trying to sell kitchen gadgets. I do understand that RVs have kitchens, which might lead RVers to buy kitchen gadgets, but it seems like those items too are available in just about any regular store. Do people get caught up in the frenzy of shopping at the Big Tent, only to wake up to reality later and find their yellow freebie KOA tote bag full of silicone bowl covers and long skinny plastic chip clips? The least explicable booths were those selling makeup, hand creme, and jewelry (especially an “ion” bracelet some lady tried to slip on my wrist). I didn’t stop at any of those booths, but from my cruise past, I didn’t see anything that looked unique or revolutionary. My favorite booth was the one run by Minute Rice. 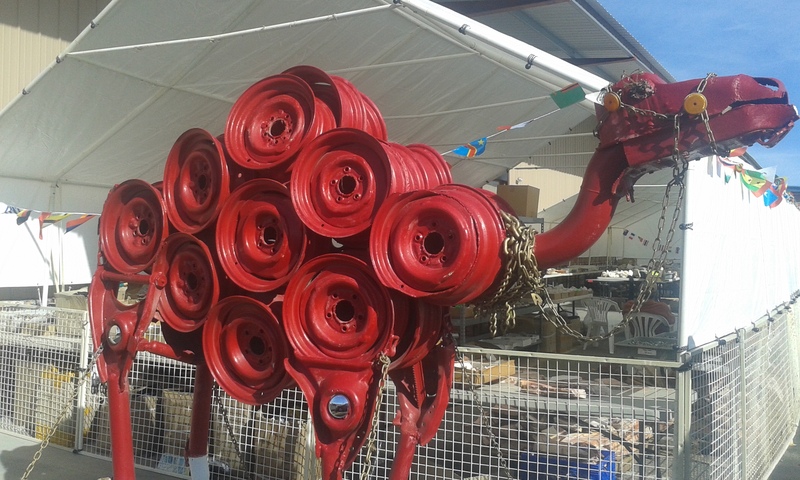 There was a wheel to spin and prizes to win. When I spun the wheel, it stopped on “emery board.” Boring! However, the nice ladies were also giving out two-packs of the precooked, microwaveable rice. There was even a choice: white, brown, or jasmine. And they didn’t want my email address! I know I mentioned it was crowded in that tent, but let me just say again, the place was packed. At one point, the crowd in the aisle was at a complete standstill. There was a tall young man next to me, and I asked him what he saw up ahead. He said it was just a bunch of people standing still. As soon as I made it out of that quagmire (without ever seeing a reason for movement to have ceased), I ducked out of the next exit door into the sunshine. There were more booths on the outside around the perimeter of the Big Tent, but nothing held my attention long enough for me to stop. When I went back the following Tuesday (because I was in the area to purchase items from several of the booths in the Tyson Wells shopping area), the Big Tent was mostly the same. The Minute Rice ladies were gone (they must have run out of rice), but I made up for it by playing a couple of fun and silly games at the Progressive booth, where the workers were a bunch of young gals dressed like Flo! There (thankfully) weren’t as many people in the Big Tent, so we all had a little more elbow room. As I left the area, I decided The Big Tent (like Mardi Gras) is definitely something to see once, if one is in the right place at the right time. I wasn’t sure I’d visit the Big Tent again, but I knew if I did, it wouldn’t be on opening day. I hoped if I did go back, I’d own a working camera so I could get a photo of that man in the bed. In 2016, I did visit the Big Tent again, but not on opening day. There was no need for that. 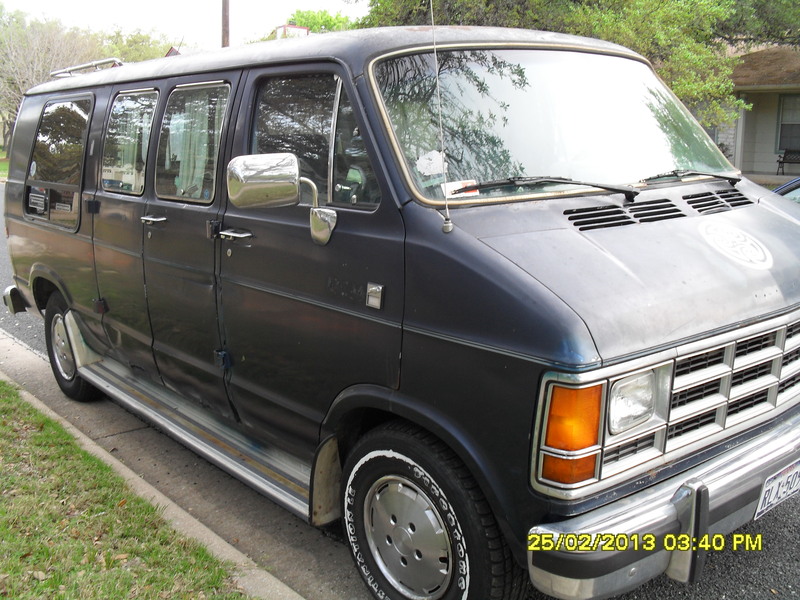 I wasn’t looking for a summer job because I already had one lined up, and I wanted to avoid filling the van with unnecessary items, even if they were freebies. 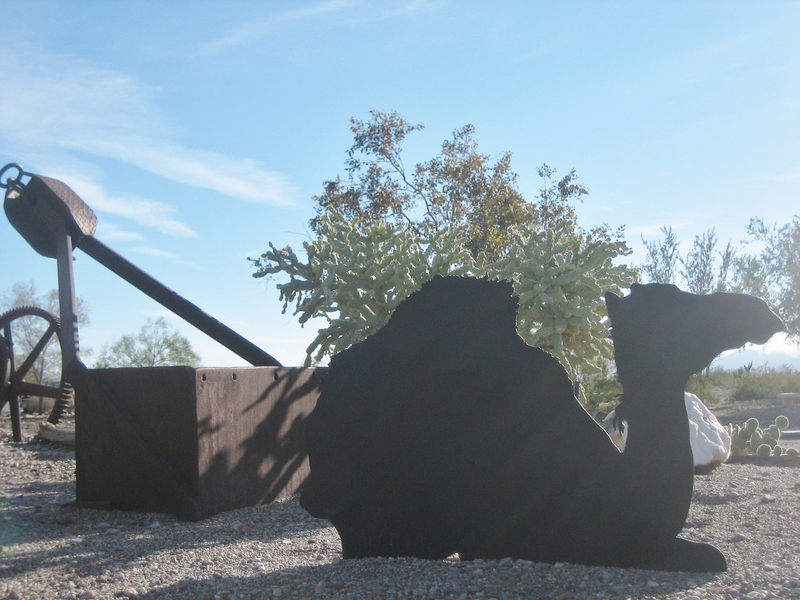 I believe I went on the Wednesday after opening day, on my last day in Quartzsite. Again, no one was being let in before the official opening time of 9am. I milled about outside the north entrance with the other early birds. While I was waiting, I got a text from my friend Tina who was at the Big Tent to look for a job. 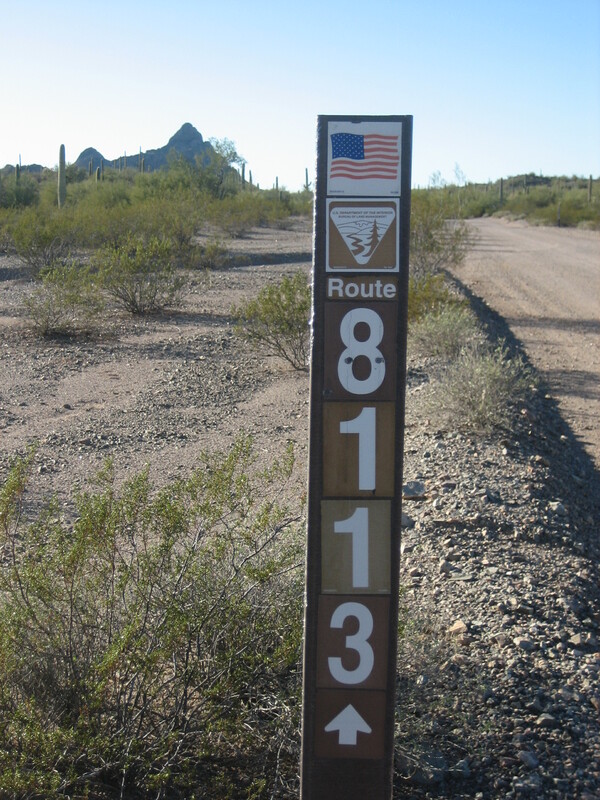 She met me at the north entrance, and we walked in together at nine on the dot. There weren’t very many people browsing through the tent that day, so there was plenty of elbow room. We hadn’t gotten past very many booths when a guy working for Direct TV tried to waylay us. Who provides cable in your home? the guy asked. Oh, I said casually, I don’t have a home. Tina snickered and the guy was quietly confused just long enough for us to escape. The next guy who tried to interrupt our rambling was in a booth with hair-salon chairs. He called out aggressively, Ladies, what appliances do you use to style your hair? I told him, I don’t style my hair. It does whatever it wants. He didn’t know what to say to that, and we walked on. One good-looking young East Indian man with a British accent drew me right into his booth. It was a large booth, and there were several salespeople in it trying to sell reusable heating pads. The pads were pretty cool There was a metal disc in them and when the disc was clicked, the goo inside the pad got hot. 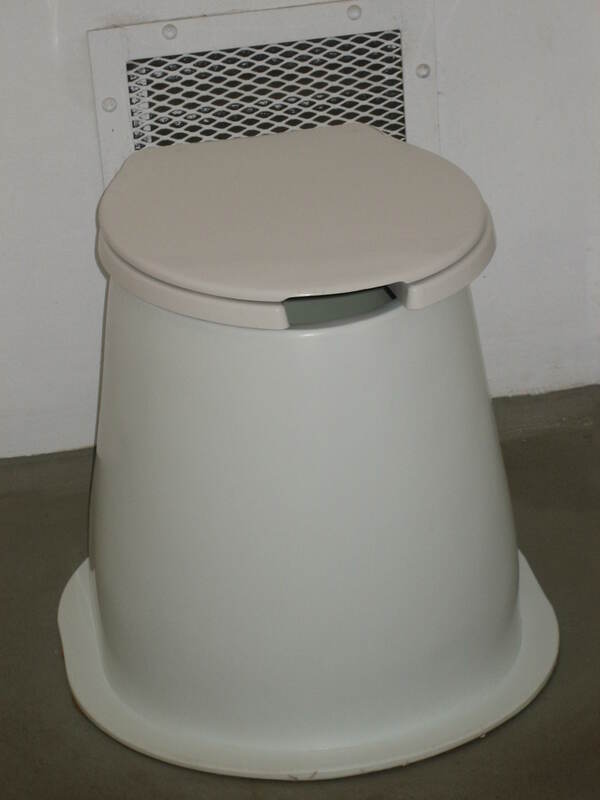 The pads could also be used cold by placing them in the refrigerator for a couple of hours. The young man was trying REALLY hard to sell the product to me. I finally had to tell him I wasn’t going to buy anything, but said he was doing a great job. We sort of squeezed each other’s hand in farewell, which made me a little giddy. I got excited when I saw a sign with my name on it. Well, it was sort of my name. When I asked the man standing behind the table if I could take a photo of the sign, he insisted on putting the product beside it. Well, ok. I tried to explain to him that my name is Blaize, and I like to take photos of signs with my name on it. He only seemed concerned with showing off the product, which I guess makes sense because it’s his job to sell the stuff. I know nothing about the quality of Micro-Blaze, so I cannot recommend it. However, readers, you now know it exists. Just down from the Micro-Blaze booth, I saw the salesman I’d been thinking about all year, the man selling RV bedding. This is the sad sounding RV bedding salesman (identifying features removed). Sometimes when I stay in bed for days at a time, I feel depressed. Maybe this guy really needed to get out in the sunshine. In 2015, I sadly had no camera to take a photo of the salesman and his wares, but in 2016, I was prepared. I walked up to the man and said hi. He said hi to me and started telling me about his special sheets. He sounded super sad. He sounded like a robotic recording. He sounded like a super sad robotic recording. The way he gave his speech about his special RV bedding did not make me want to buy his product. The way he gave his speech almost made me want to cry. I don’t know if he was having a bad day or if he was just generally tired, but his enthusiasm level was way low. I asked him if I could take his photo, and he said yes. This guy, even though he seemed really down, was the high point of the Big Tent for me. I walked around after I talked to him, got a bright yellow (and cheaply made) tote bag from KOA and played a sort of slot machine game with the Flo lookalikes at the Progressive booth, but nothing made me happier than finally getting a photo of that guy. Now you know a little bit about what goes on at the Big Tent so you can decide for yourself if you want to check it out. This post was drawn from two previous posts, “The Big Tent” and “The Big Tent, 2016.” I took the photos in this post. 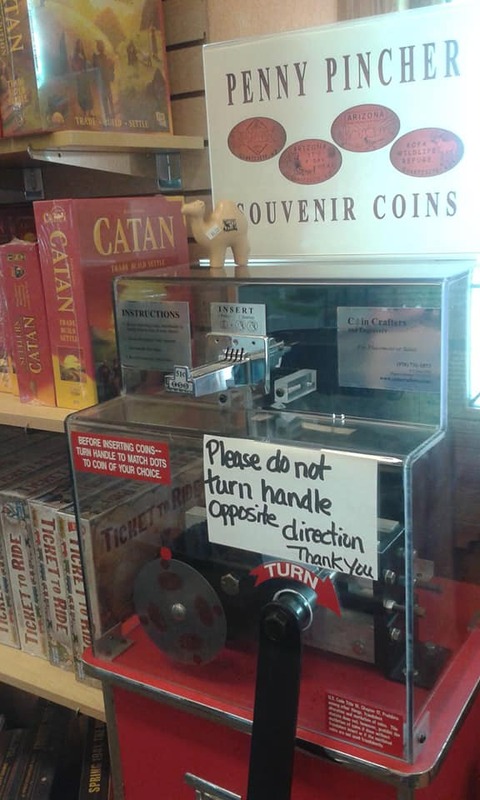 As we walked past the store, I saw a sign alerting me that I could press pennies inside. What? 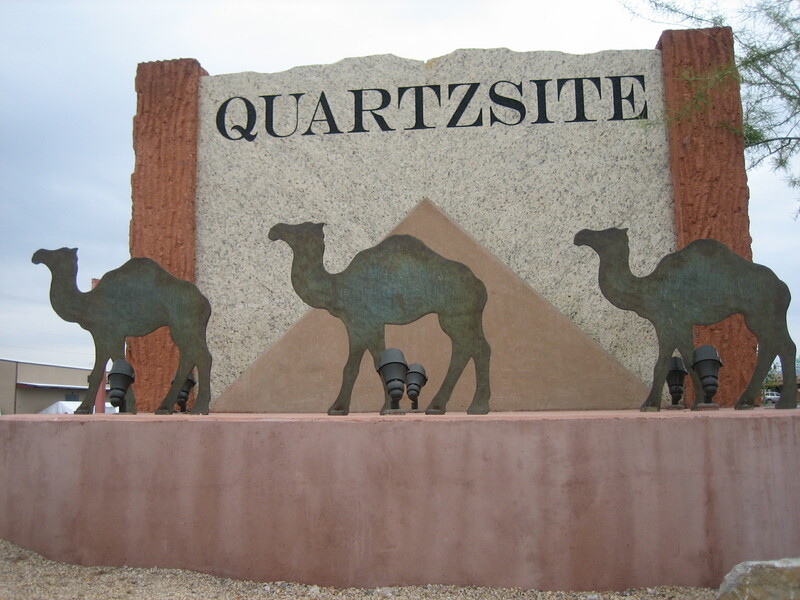 This was my fourth winter stay in Quartzsite, and I was only now discovering the penny squishing machine? Apparently so. I decided to smash a penny later, when I had more time. For some reason, I only encounter penny presses in Nevada, Arizona, and the California desert. I’ve smashed pennies in Jerome (AZ), Las Vegas (NV), and Baker (CA). 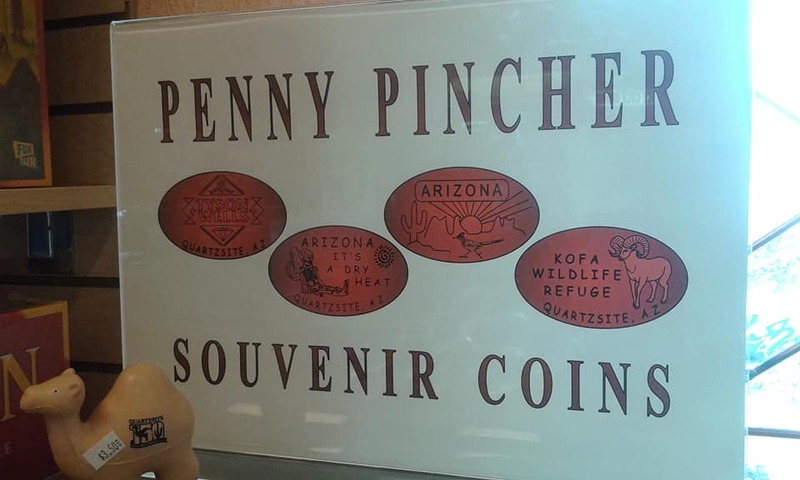 Why have I never seen a penny press in New Mexico? This is the press…er, pincher…I used to squash a penny for my friend. All of my penny pressing is on behalf of an old friend of mine. Years ago, she told me she collected smashed pennies, so now I want to squash a penny for her whenever I see one of the machines. My endoeavors may be in vain at this point, but I’ve continued to perservere. I went back into the gift shop at Tyson Wells one morning a few days later. The place was deserted, save for the very chipper woman working. She was stocking, but she told me to let her know if I needed any help. I said I just wanted to make use of her penny press, which I had already seen standing near the check out counter. She said that was fine and went about her work. 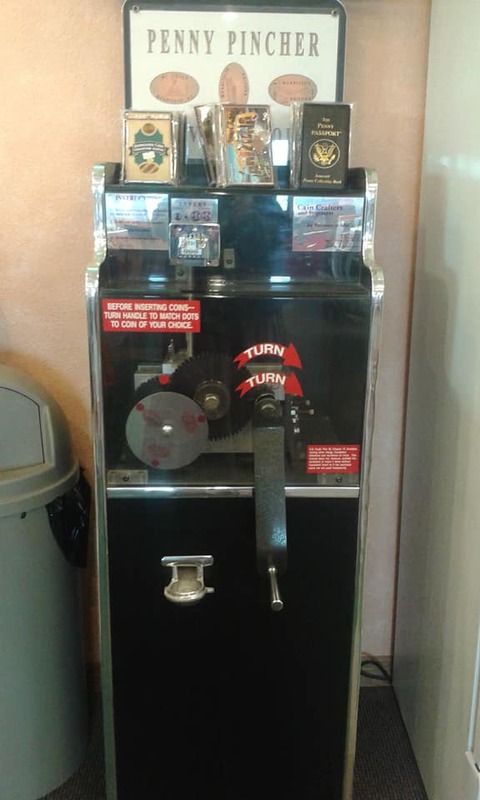 I walked up to the machine and fished two quarters and a penny from my coin purse. I fed them into the machine, then decided on what design to engrave onto the penny. I decided on Hi Jolly’s tomb since it was the most uniquely Quartzsite of the three designs.Then it was time to turn turn turn the crank unitl the penny fell with a clank into the dispenser cup. I only saw this penny press as I was walking towards to door to leave. My work was doine. I called out thanks to the woman working and headed to the door. I stopped in my tracks after about two steps. There was a second penny press right next to the door. I’d never seen two penny presses in one place before (and I’d never seen them called penny pinchers either.) I didn’t press a penny in the second press, but I did take a photo of it. 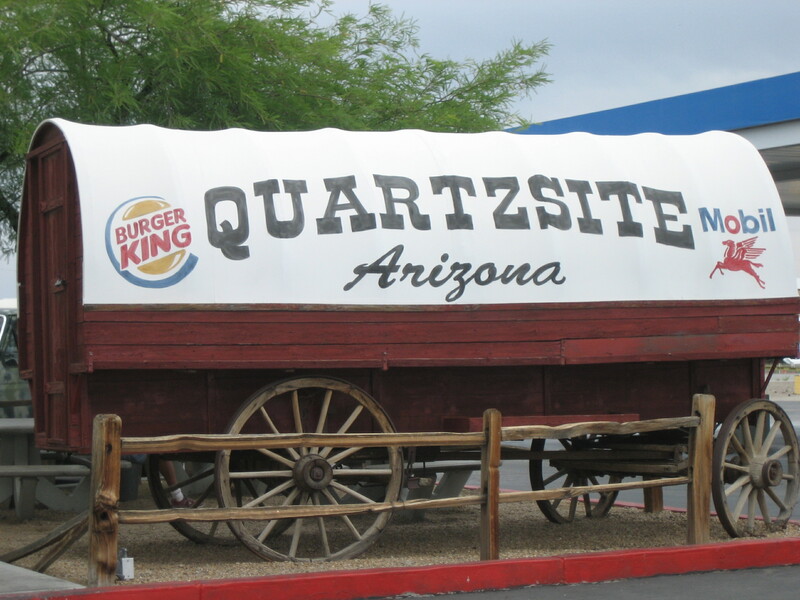 Now I know Quartzsite, AZ is also on the list of places where pennies can bre pressed. Unfortunately, the information about Adamsville on the sign is not easily readable in this photo. 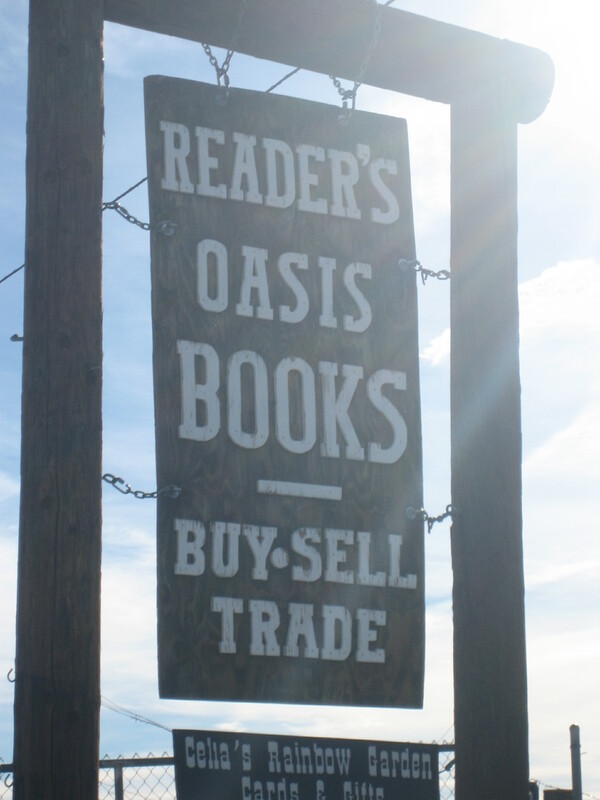 While I was exploring in Celia’s Rainbow Gardens in Quartzsite, AZ; I ran across an area dedicated to Adamsville. 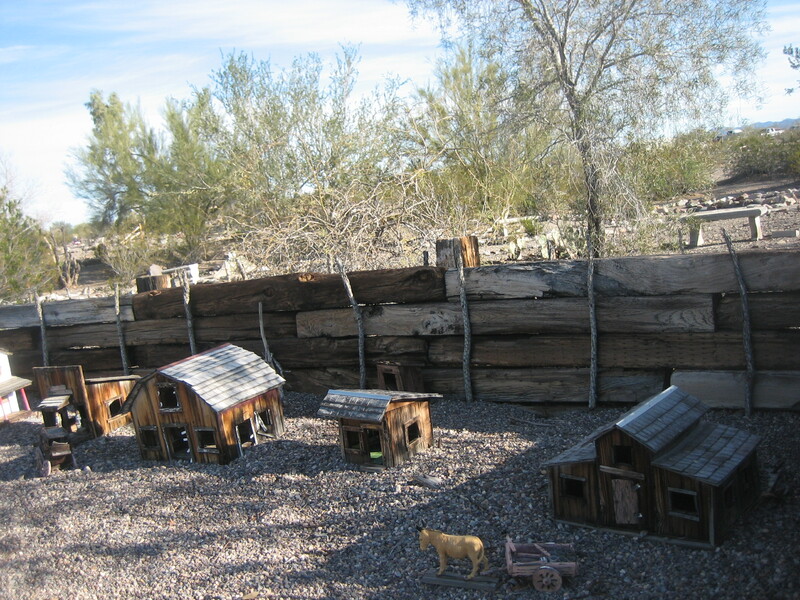 wooden buildings…had been given to them by the man who had built them, Babe Adams, from Parker. Four of the fifteen little buildings that make up Adamsville. 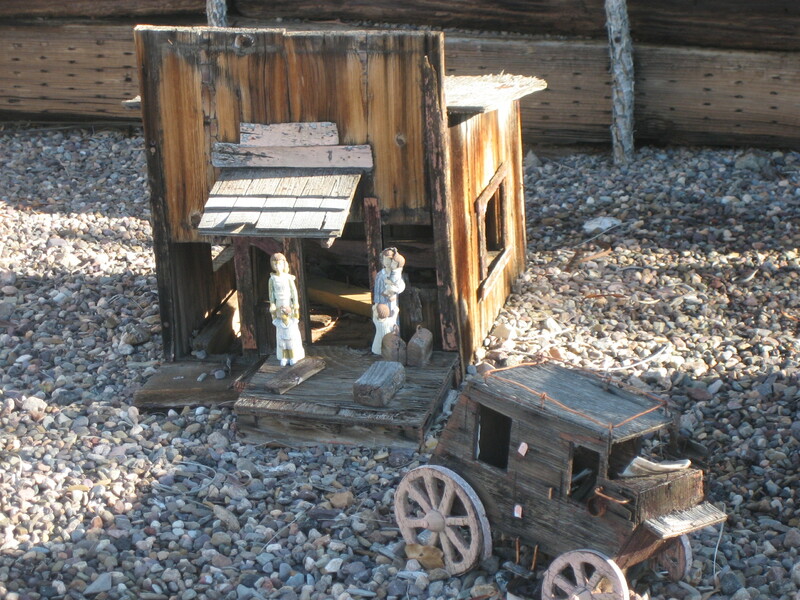 There [are] 15 little buildings, including a schoolhouse, church, sawmill, barn and stables, marshall’s office, stage depot, log cabin, house, motel, saloon and house of ill repute, as well as a boot hill and more. 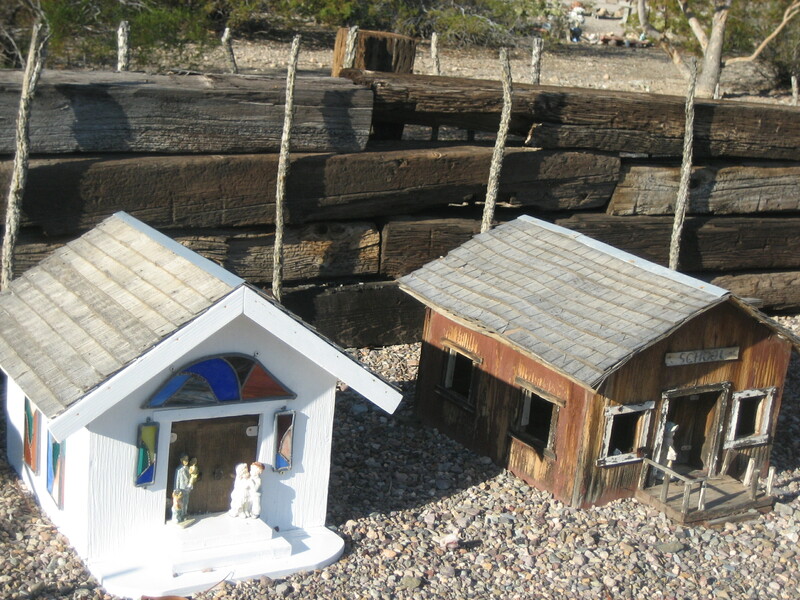 Celia’s Rainbow Garden includes “Adamsville,” a miniature village started in 1974 by Babe and Babs Adams at the RV park they lived at in Castle Rock. 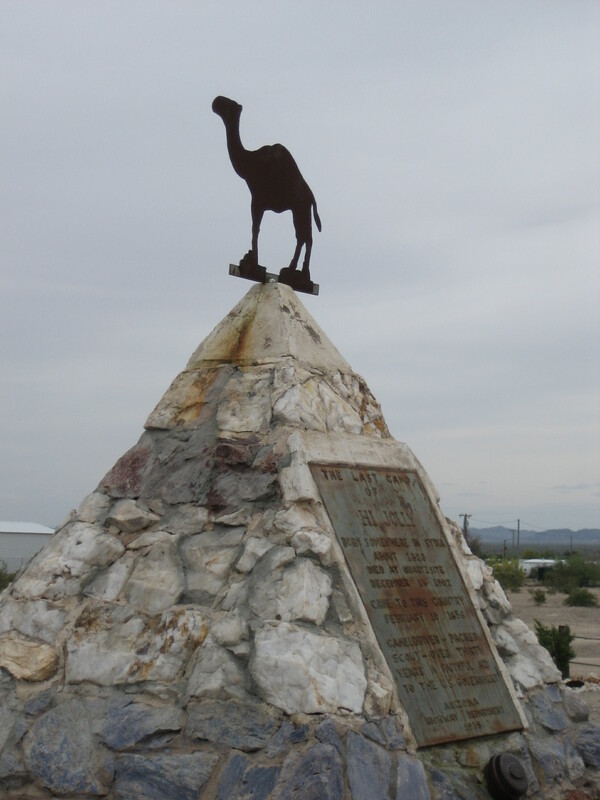 They donated the village to the Quartzsite Historical Society, who restored it and placed it here in 2001. I found no indication of who exactly Babe and Babs Adams were or why they liked creating tiny buildings to make up a little Old West town. 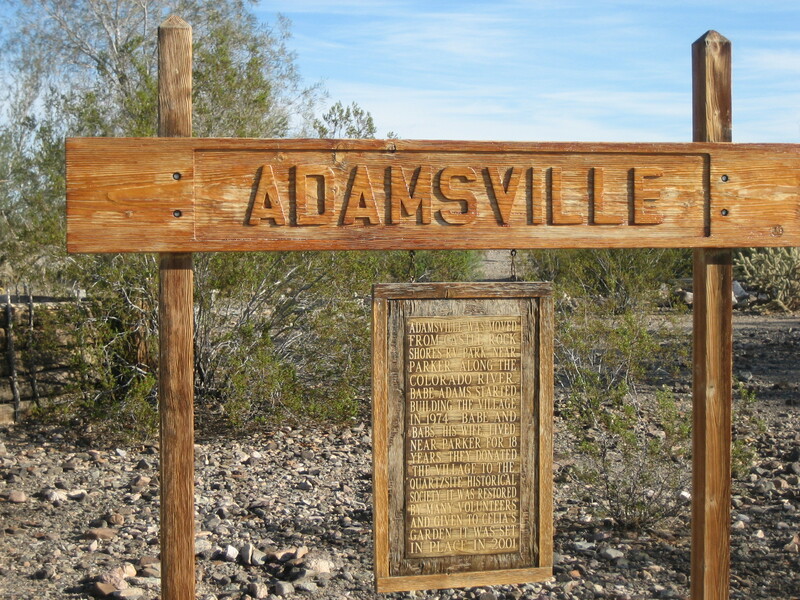 I’m also not sure if the little town is named for Babe and Babs Adams or if it is supposed to be a replica of Adamsville, which was one of the first settlements in the Arizona Territory. The aforementioned Celia’s Rainbow Gardens website says the buildings have been restored at least twice. 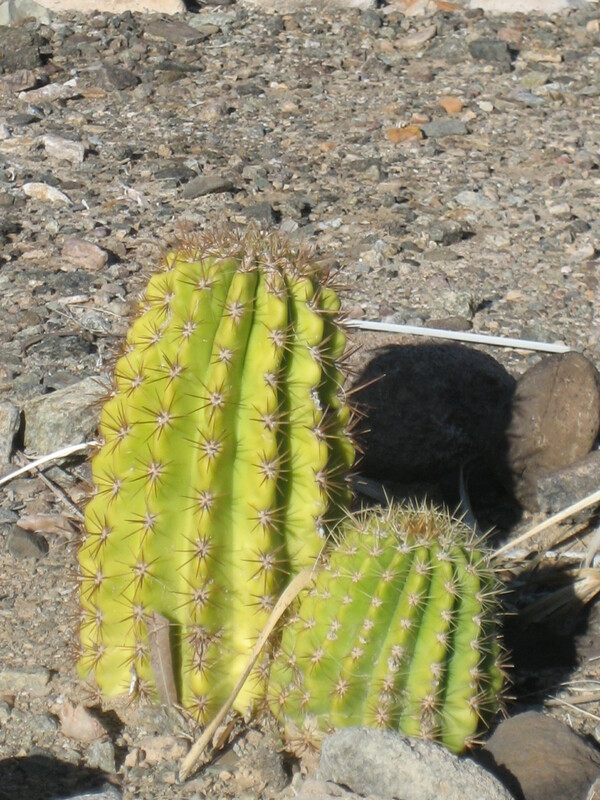 I guess the desert weather is pretty hard on them. 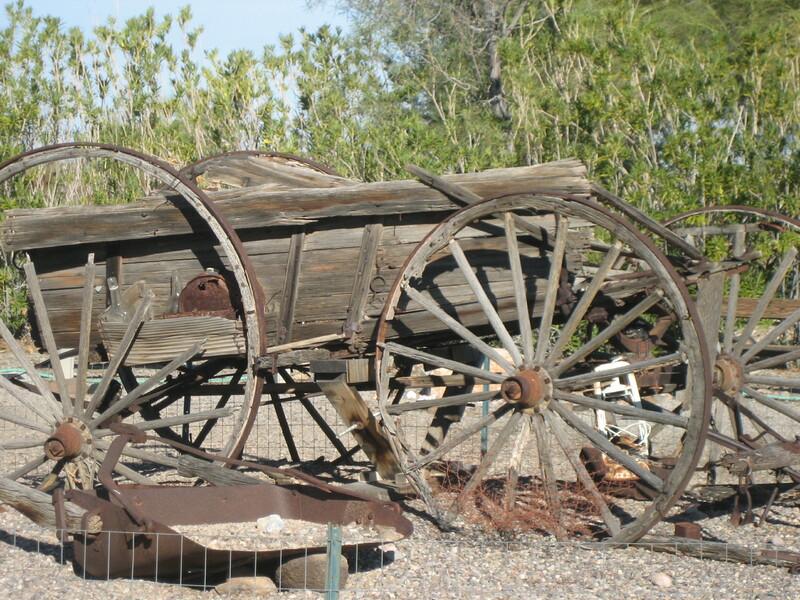 I was not able to find any information about who the wagon belonged to or what it was used for or in what time period it was used. I wasn’t too thrilled by Adamsville, but I did spend a few minutes looking at the little buildings making up the town. 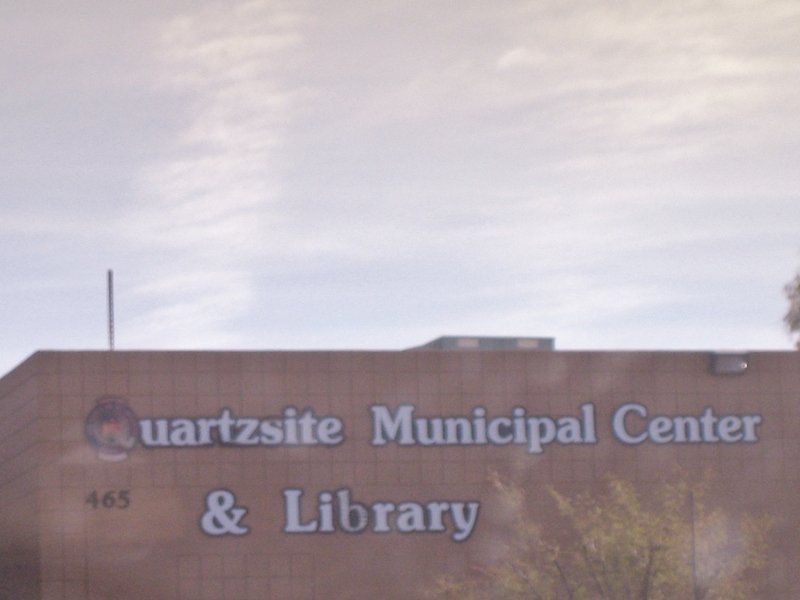 I have no idea how historically accurate any of the buildings are, but maybe the Quartzsite Historical Society could offer more information to anyone who’s interested. 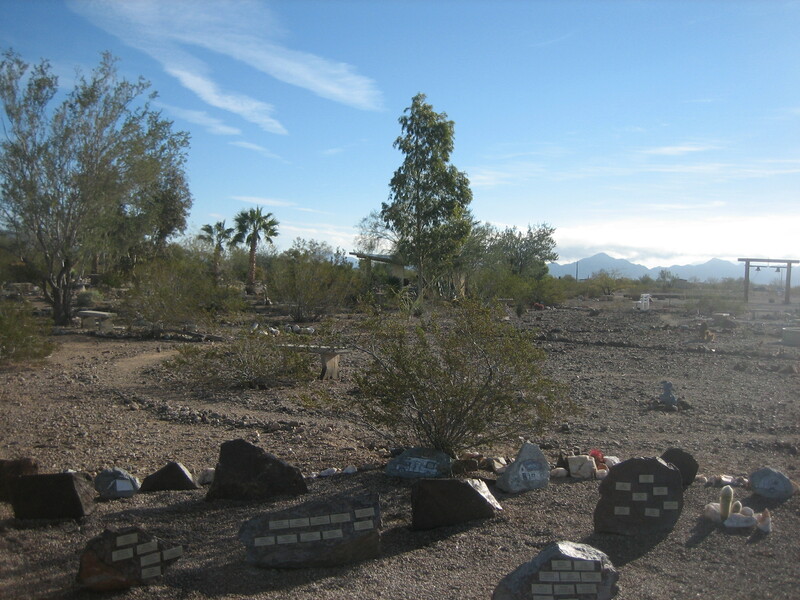 One of the reasons I really wanted to visit Celia’s Rainbow Gardens was because one of my readers at the RTR told me there was a memorial space out there for van dwelling women. That sounded really cool, so I went looking for the memorial one morning. I didn’t know where within the gardens the memorial was, so I took my time looking around. Finally, I found what I’m pretty sure my reader was talking about. Maybe I misunderstood what my reader told me, because the memorial isn’t exactly for van dwelling women. It’s broadly for women who travel in RVs and specifically for women in the RVing Women community. This photo shows the small plaque on the rock at the back of the circle pictured above. 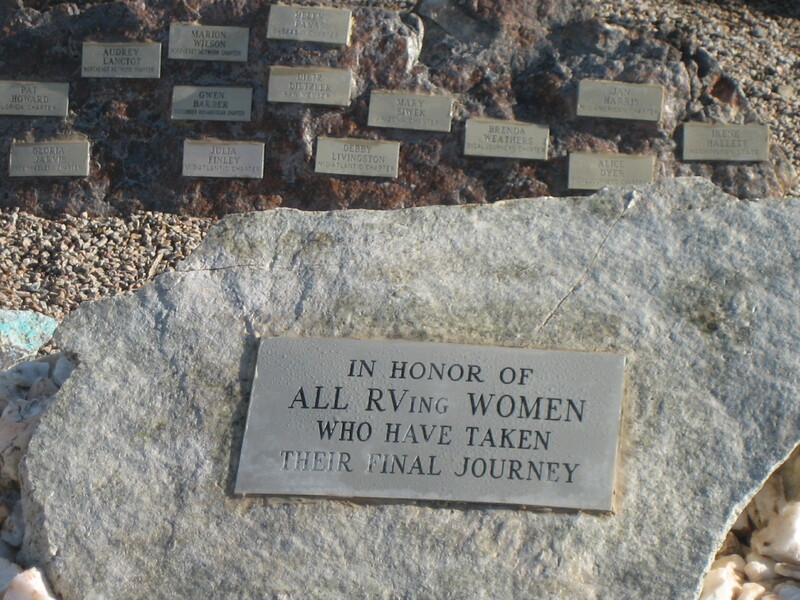 The smaller plaques feature the names of RVing Women who have taken their final journey. RVing Women is a National network whose members come from across the US and Canada. Established by and for women who are interested in RVing, we have Chapters across the country that offer camping, educational, and social events. We are a diverse group of women who enjoy many indoor and outdoor activities and hobbies. 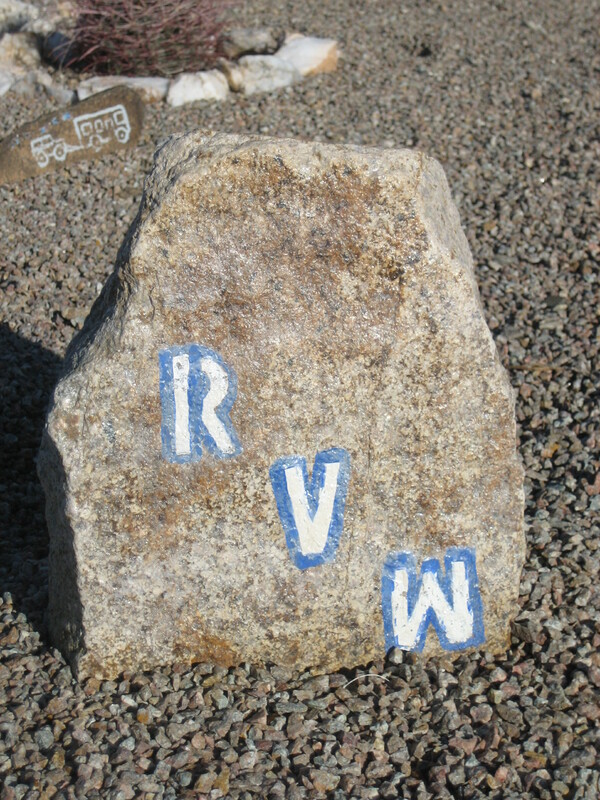 RVing Women offers support and friendship for women who plan to travel by RV, already own one, have hung up their keys, or are just dreaming about RV possibilities. 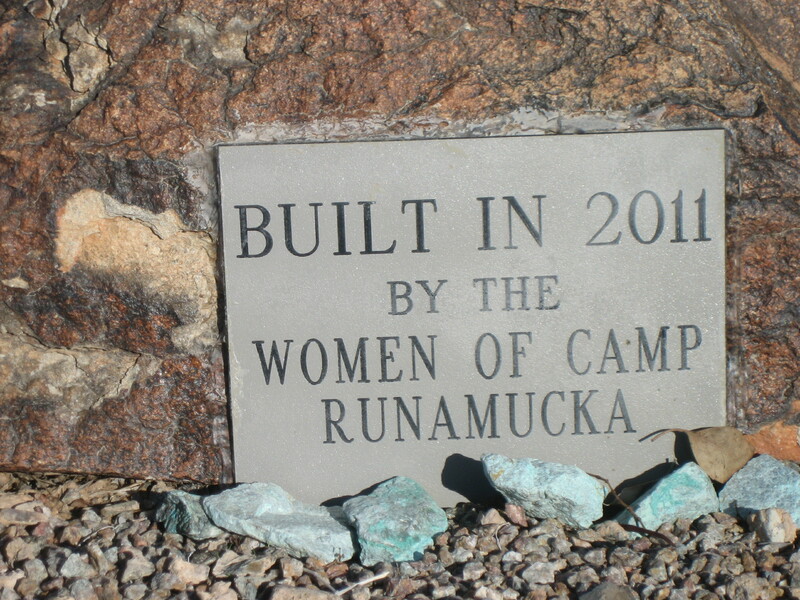 A sign in the RVing Women space says this memorial was built in 2011 by the women of Camp Runamucka. 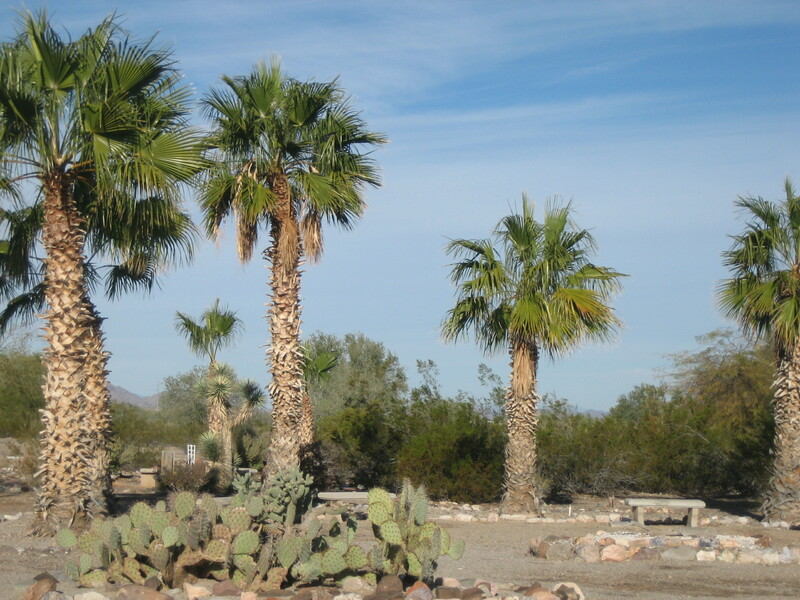 From what I’ve read, members of different RVing Women chapters meet in Quartzsite each winter. They camp together and attend workshops and socialize. Sometimes they have work days at the RVing Women memorial within Celia’s Rainbow Gardens. 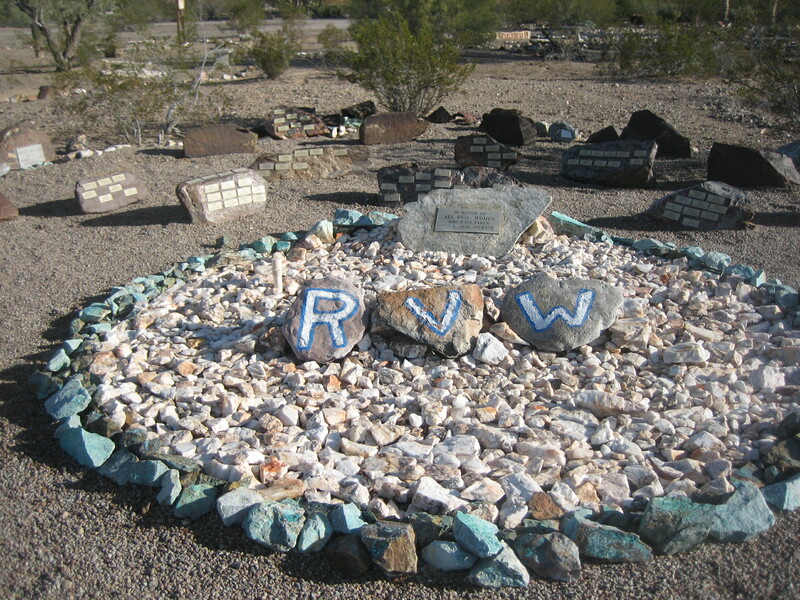 It is the RVing Women who maintain this memorial area to honor and remember their RVing sisters who have passed away. 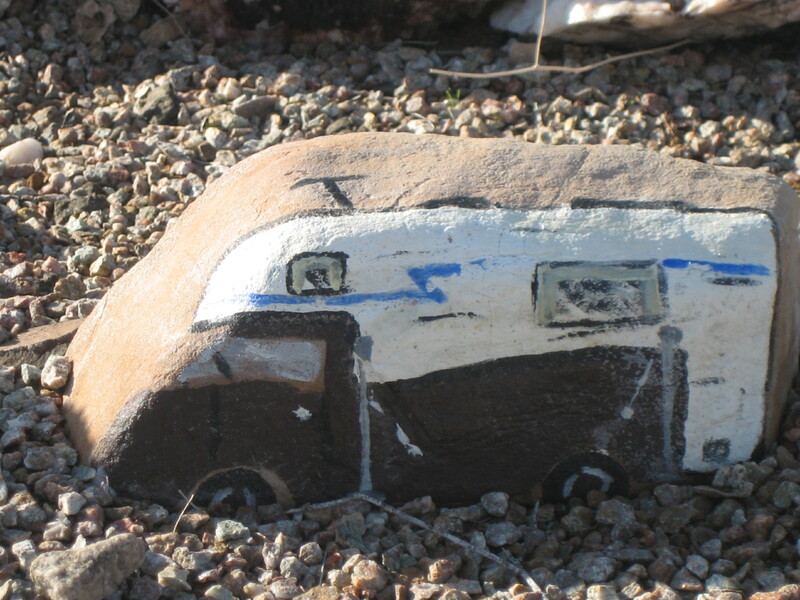 I especially enjoyed looking at the rocks upon which folks have painted different types of RVs. Throughout the memorial area, there are small plaques with names on them affixed to larger rocks. Each small plaque features the name of an RVing Woman who has passed away. I bet it is comforting to visit the memorial and find the name of an RV-loving friend or sister or daughter or mother or partner who has left this earth. It must be a good place to remember and reflect. I wish there were a memorial space for van dwelling women. If there is one, I wish someone would tell me about it. If there isn’t, I wish someone would start it. A premier organization for women interested in the RVing lifestyle. The abilities, skills and resources of each member. The time and efforts of those who provide leadership and support. Our chapter structure which provides a supportive network. 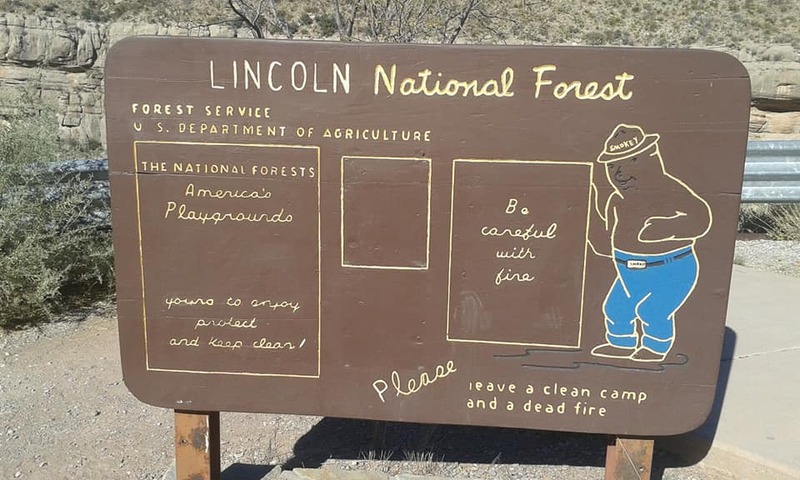 Educational opportunities to promote safe RVing. Roadside America (http://www.roadsideamerica.com/tip/12493) gives directions to get to Celia’s Rainbow Gardens. Once inside Celia’s Rainbow Gardens, have a look at all the memorials while looking for the RVing Women space; I don’t know how to explain how to get there.